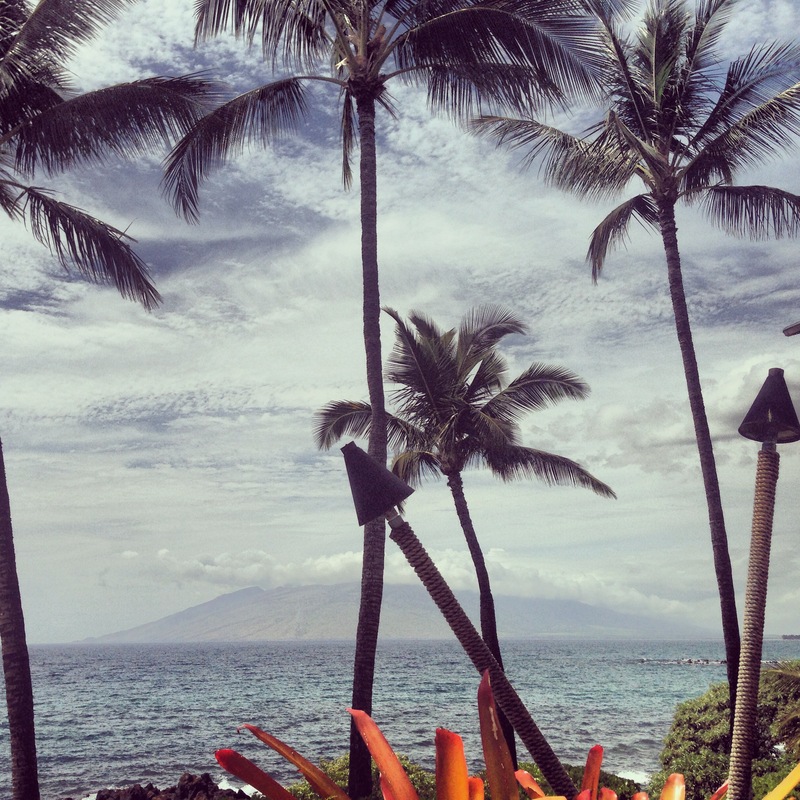 I wish I was back in that beach chair on Maui right now… Relaxing and enjoying the view. 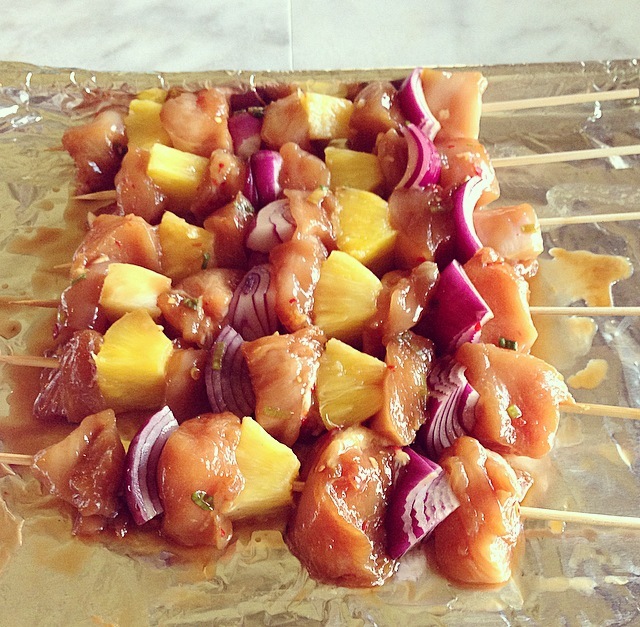 So for today Going Hawaiian Style treat I’m making Huli-Huli Chicken… On a Stick. 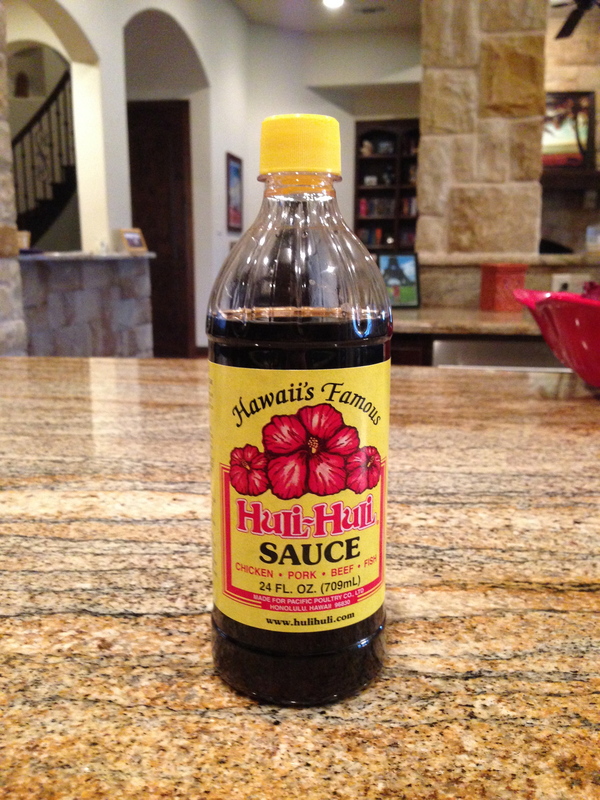 I’ve mentioned Huli Huli sauce several times over the past couple of day but I’m not sure I’ve explained what it is…. Huli Huli sauce is a Hawaiian sweet and savory marinade use for all types of meats especially whole chickens. It can be thickened into a sauce or gravy too. Not only do I use this sauce for Chicken and Pork I’ve even used this to make Huli Huli Salmon and it was to die for. The term Huli Huli literally translates to “Turn-Turn” and this is what the children would shout when it was time to turn the Chickens over on the grill. With these skewers the children would have to shout “Huli Huli, Huli Huli, Huli Huli, Huli Huli….” Say that 5 times fast!! But whole chicken isn’t always easy to serve a large crowd (unless you have a trailer sized grill and if you have one of these monster grills…. Do you want to come to a Luau?). I’m taking this Hawaiian Classic and just putting it on a stick for easy eating and to feed the masses. Besides what’s more delightful than Chicken On a Stick? Oh did I mention there is pineapple on this too? Sweet, Juicy, Caramelized, Grilled Pineapple! Is your mouth watering yet? Heat ¼ cup of the Huli-Huli Sauce, brown sugar and cornstarch in a small microwave safe glass bowl on high for 30 seconds. Stir to dissolve the sugar and cornstarch. Then add in the remaining Huli-Huli Sauce, Garlic, Green Onion, Chili Paste, Sesame Oil, and Dark Soy. Stir the marinade to combine then cover and place in the freezer to chill while prepping the chicken. Cut each Chicken breast into about ten 1 inch sized cubes. Place the cubed chicken in large zip top bag pour over the marinade and let it sit in the refrigerator for at least 4 hours but 24 hours is even better. 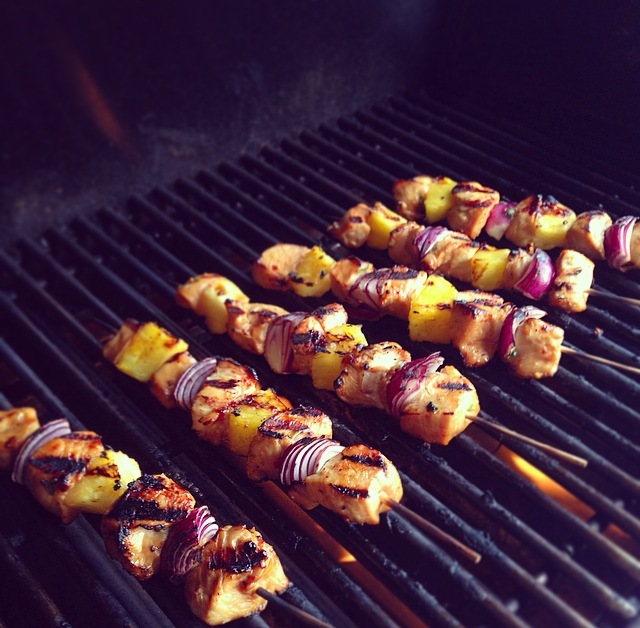 After the Chicken has marinated assemble the skewers…. This can be done anyway you like… but try to begin and end with the chicken. I did Chicken, Onion, Chicken, Pineapple, Chicken, Onion, Chicken, Pineapple, Chicken. On the last skewer I ran out of Pineapple… What can I say it’s one of my favorite fruits. Pre-Heat the grill to Medium/Medium-High Heat and brush the grates with a little oil so the chicken doesn’t stick. Grill the chicken about 3-4 minutes per side (about 12-16 minutes in all) until the pineapple is caramelized, the onions a little charred and the chicken is cooked through. 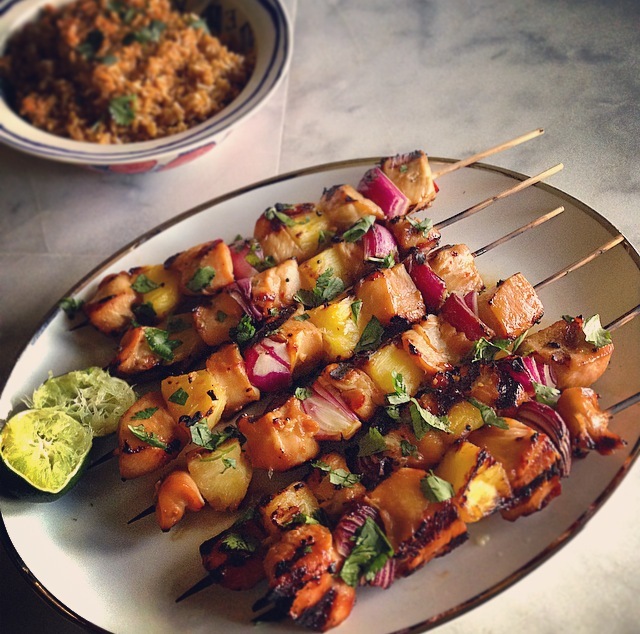 Transfer the cooked skewers to a platter/tray, squeeze the juice of one lime over the top, and cover tightly with foil. Allow the chicken to rest for at least 10 minutes. Top with fresh cilantro and serve. 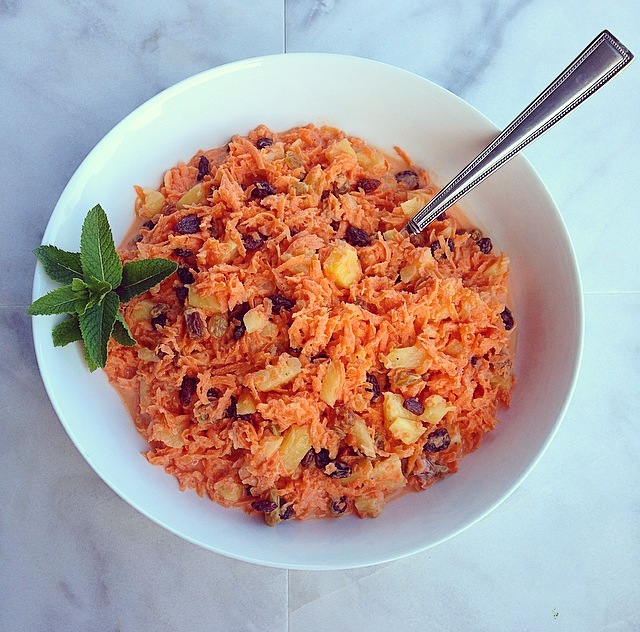 This Tropical Carrot Salad is something that I can remember helping my Grandma Peggy make when I was a little kid. She would let me grate the carrots using her food mill (a hand cranked, old-fashioned food processor) that was probably from the 50’s or 60’s, and for the record that food mill works way better that my new one. Then I would drain the pineapple reserving the juice (Granddad and me would share the leftover pineapple juice when we were done… He loved pineapple juice as much as I did). She would have me add in the raisins, the mayonnaise, and mix everything up in a big bowl. Both my Grandmothers and my Mother were always good to let me help in the kitchen and it’s where my love of cooking came from. Wash and peel the carrots. Drain the pineapple tidbits and crushed pineapple reserving the juice. Using a food processor fitted with a grater attachment, a good old-fashioned food mill, or a box grater, grate the carrots; you should have about 4 cups +/- depending on the sized carrots used. Squeeze as much juice out of the grated carrots as possible and transfer to a large mixing bowl. Add in the drained pineapple, and the raisins, toss to combine. Drain off any excess liquid from the salad before serving. *Note: If you can get carrots with the green tops they are usually sweeter. And remember to include your kids and grandkids in the kitchen because those are memories they will treasure forever. Thanks Tonya 🙂 It’s hard to be grilled pineapple. Even my husband who doesn’t eat fruit loves grilled pineapple. These dishes look amazing! I’ve never heard of huli sauce so will have to check it out! Travel really inspires some favorite meals doesn’t it? You’re killing it! Every one of your recipes is absolutely mouthwatering! This is getting me anxious for our Hawaii trip and for summer barbecues! It’s been fun getting out of “Texas” and pretending I’m on vacation in Hawaii this week. Which Hawaiian island are you visiting or are you going to hit them all up? We’re just doing Oahu this time, but are already making plans to go back without kids and explore more! Thanks for the suggestion, I’ll add it to the list! Mel will you stop making me drool? 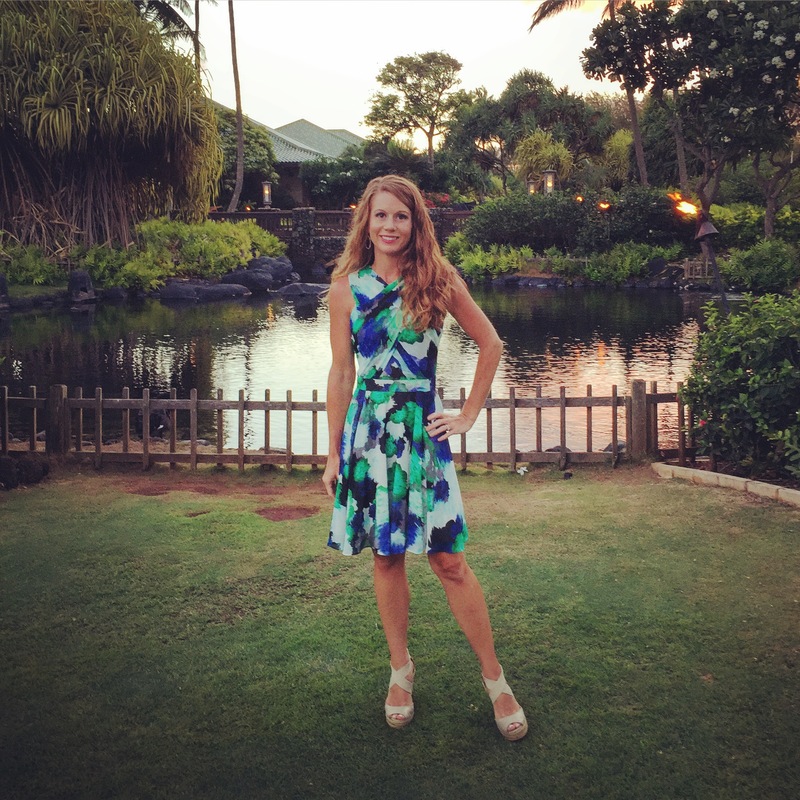 Seriously (yeah) your Luau recipes are great! Delicious skewers and loving your carrot salad too. Looks like Huli Huli sauce is available at World Market so I’ll have to make a trip over there to pick some up. Ahhh, love Hawaii. This might make it on next weeks dinner menu. Husband will be pleased! Aww thanks Janessa!! I’m totally addicted to the Huli Huli sauce and it’s great on all kinds of meats 🙂 hope you give it a try and let me know what you think.